Trailering, even a short distance, heats the hubs. 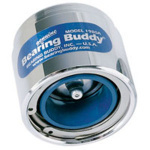 When the wheels are submerged during launching, the hubs suddenly cool and the air inside the unprotected hubs contracts, forming a vacuum which draws in water through the rear seals. There is no such thing as a rotating seal that stays perfect. 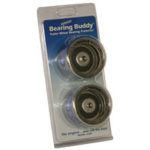 Water and grit thus drawn into the hubs relentlessly destroy bearings. 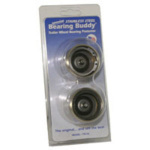 When properly installed and maintained, Bearing Buddy® prevents wheel bearing failure and eliminates bearing repacking. Boat trailer wheels can be completely submerged. These trailers, because they are not used regularly, are also subject to bearing corrosion and failure from condensation moisture from air sucked into hot hubs as they cool. 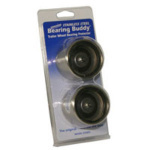 Moisture stays in the hubs causing rust and pitting until they are reheated when the trailer is used again. 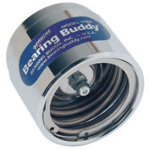 HOW BEARING BUDDY WORKS The axle hub is filled with grease until the grease forces the Bearing Buddy piston outward about 1/8 inch. 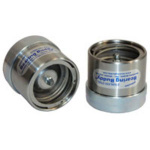 Because the piston is spring loaded, the piston exerts a slight (3 psi) pressure against the grease, which maintains a slight pressure between the inside of the hub and the outside environment. When the hub is submerged, water cannot enter the hub because of this pressure. 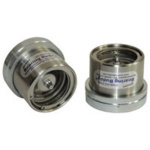 An automatic pressure relief feature prevents over-filling and over pressurization. Without this feature, the inner seal will be damaged. 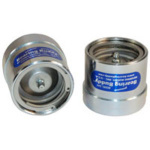 Grease can be added to the hub through an easily accessible grease fitting located in the center of the piston. Lubricant level (and pressure) can be checked quickly by pressing on the edge of the moveable piston. If you can rock or move the piston, the hub is properly filled. 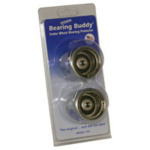 Bearing Buddy will last the life of your trailer. The outer barrel is made of steel and is triple chrome plated. 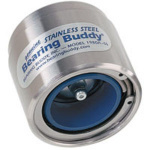 Internal Bearing Buddy parts are made of stainless steel. 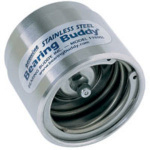 Bearing Buddy is also available with a stainless steel barrel for maximum corrosion protection. Model #1980, for example, fits a 1.980'' bore hole diameter. Our 2080T (threaded model 2080) will fit the Reliable oil bath unit that is on many of the EZ Loader trailers.